1. Measure the flour into a bowl. Pour in the coconut dairy-free milk alternative slowly, making sure you have no lumps. Stir in the oil. Allow to stand for five minutes. 2. Meanwhile place a 23cm (9in) frying pan over a medium-high heat. Oil the surface using a little sunflower oil on a kitchen towel or a spray sunflower oil. When the pan is nicely hot, pour in the pancake batter until the dollop is about two-thirds the size of the pan. 3. Quickly pick up the pan and swirl it around so the batter spreads across the surface. Fry until well browned (about two minutes), then use a fish slice to loosen the pancake. Flip it over and fry for two more minutes. 4. 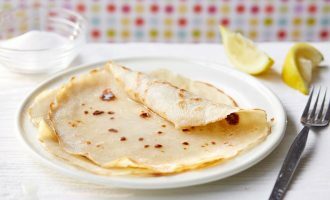 Place the finished pancakes on a plate. Repeat the process until the batter is used. Serve hot with a squeeze of lemon juice and a sprinkling of sugar.